ACL number for the standard ACLs has to be between 1–99 and 1300–1999. Once the access list is created, it needs to be applied to an interface. You do that by using the ip access-group ACL_NUMBER in|out interface subcommand. in and out keywords specify in which direction you are activating the ACL. 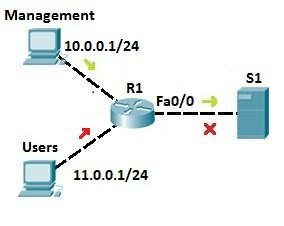 in means that ACL is applied to the traffic coming into the interface, while the out keyword means that the ACL is applied to the traffic leaving the interface. The command above permits traffic only from the host with the IP address of 10.0.0.1. At the end of each ACL there is an implicit deny all statement. This means that all traffic not specified in earlier ACL statements will be forbidden, so the second ACL statement (access-list 1 deny 11.0.0.0 0.0.0.255) wasn’t even necessary.